The primary function of design is to make something useful. Unfortunately, most products are not accessible to everyone. For adults and children with non-typical cognition and learning styles, technology can help even the playing field. Design can combat negative stereotypes, and take into account an individual’s deficits while capitalizing on their cognitive strengths. We will look at design solutions targeting specific conditions like ADHD, dyslexia, and autism, in addition to exploring the core problems technology is trying to solve. We will then widen the lens to compare how many of our most commonly used devices and apps use the same tactics to achieve universal accessibility for all. Devi Pellerin is an industry veteran with over 13 years of experience strategizing complicated cross-channel products for companies like Mattel, Hasbro, Random House, Disney, Geocaching, Phillips, and Nickelodeon. 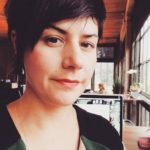 Her focus is on connected experiences with physical products, kid-focused applications, and applying game design methodologies to product design. Devi currently works with Carbon Five, Seattle. She also rides vintage motorcycles, lives on an island, and puts on the occasional art show.